If you seen Eurotrip or had any friends take the post-college right of passage across Europe you get the deal about the Eurorail. Buy one pass and tote around carefree in an oversized backpack speaking different languages and absorbing different cultures along the way. The Eurail system is a confusing mix of timetables, acronyms, rates and the general chaos of dozens of separate companies from an entire continent getting on the same page. Different sources seem to give you different information. According to one source we couldn’t buy the pass in America. Another said we had to buy it America. There are a wide range of different passes, and there are a handful of companies offering them. To this moment we are still left wondering if we snagged the best deal. When you receive your pass you are handed a timetable, and map of the system, and the pass itself. In the abstract you are aware of how many days you have to travel and how fast you have to do it. Other than that, you are on your own. In most cases such freedom would be invigorating. However, mistakes and lack of knowledge cost money and each route choice must be carefully researched. And even then you may not find the answer you are looking for. But all is not doom and gloom. For one, it is a very nice thought to know that you have paid for the bulk of your transportation costs. As mentioned previously you have to be on guard for routes that do not participate in the pass, and some times it may be too late. After our mix up in St. Pancras, we found that it is best to arrive in a new station, immediately seek out any information center and have the clerk tell us what routes are free. 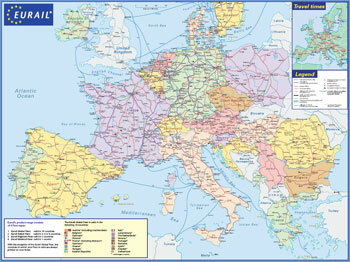 Most clerks are familiar with the Eurail pass. And, after seeing us haul around our huge backpacks, usually assume that is exactly what we are asking them. Thus far it seems that all inter-city routes are the cheapest way to go. The inter-cuty, or IC, usually make multiple stops in the country you are passing through so you cannot for the entirety of the trip. Because of the price of IC trips, we were able to hitch a ride from Brussels to Amsterdam for free. Our mastery of Eurail is certainly a work in progress and we will update you as well go. As we like to say: nothing can be worse than British Immigration.